York Spit Lighthouse – Chesapeake Chapter U.S.L.H.S. York Spit Lighthouse was built in 1870 in the Chesapeake Bay about 5 miles east of Rue Point at the southern entrance to the York River, Virginia. It was a hexagonal screwpile lighthouse with two additional fender piles, one on each of the ebb and flow sides of the structure for additional stability against ice flows. It was two stories with the second story smaller. The lighthouse replaced lightships that had been stationed here. The first lightship, which had seen service at Wolf Trap previously, was stationed at York Spit beginning in 1855. Confederates took that lightship in 1861 and destroyed it. The next lightship was stationed at York Spit from 1863 to 1864. A temporary lightship was stationed during the construction of the lighthouse in 1869 to 1870. In 1903, 1,150 tons of riprap stone were placed around the piles to protect the foundation from erosion, and in June 1,200 additional tons were placed around the lighthouse. U.S. Lighthouse Service Bulletins: September 1933 — York Spit Light Station (Chesapeake Bay, Virginia) Damaged by Storm. 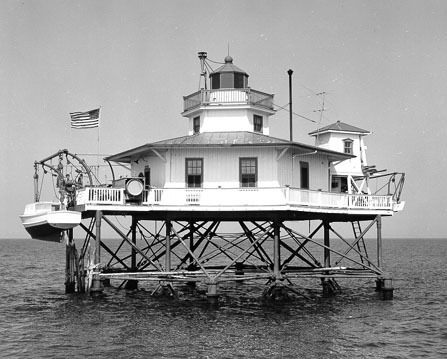 An automated flashing beacon replaced the lighthouse in 1960 and the lighthouse was dismantled. A recent hurricane ripped the platform and remaining building from the structure. The flashing beacon was then repositioned on a single pile.